Last week, a small but mighty cohort of St. Louisans got to attend the Code for America Summit. The CfA Summit is the annual “download” for Code for America, an organization (and one of our national partners) that embeds technologists in governments at every level (municipal, state, federal) to, basically, build a better user experience for government. The Summit was three days of incredible storytelling, skill-sharing, and lessons learned in civic technology from all over the country and world. Luckily, you can view all of the talks online at codeforamerica.org/summit and browse the #cfasummit hashtag for tweetable highlights. 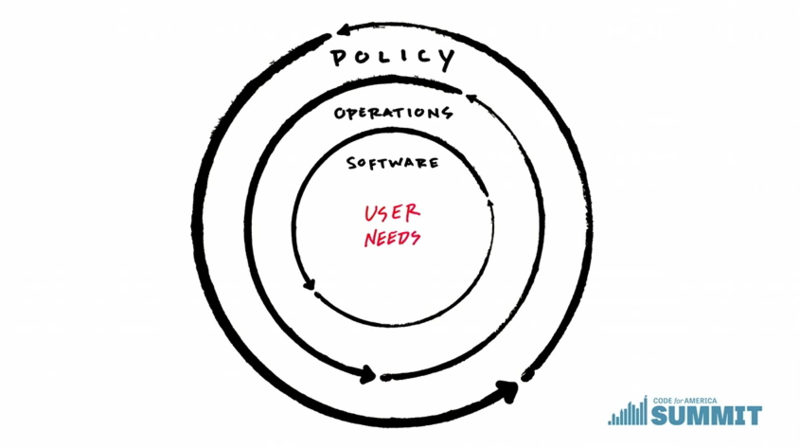 Policy is no longer shaping the apps. The apps are shaping policy. Presentation after presentation, the Code for America Summit showed amazing projects that used technology to just make government work better. Where so many of government’s digital tools had been built to accommodate legacy paperwork processes, we can now build tools that altogether reform that bureaucracy. A really good example was Jake Solomon’s presentation of a user-centered approach to food stamps, where he showed how improving the qualification process for California’s EBT program took a process that was well over 200 questions to only 10-15 necessary ones — and did away with some forms altogether (Jake gets to the meaty stuff at 8:48in his talk). A more efficient qualification process allowed for more effective delivery, which then begins to change how we design policy and law to better distribute these services. The following panel addressed the changing landscape of urban (and public) transportation. One of the standout insights in a conversation between Lyft’s Director of Transportation Policy, Emily Castor, and Jascha Franklin-Hodge, Chief Information Officer at City of Boston, was that the undeniable advantage of private enterprise over the public sector is that they can choose their customers. Business is incentivized to address the easier problems with the highest pay-off — which inherently means there will be people who are underserved, and more often than not, they are those who cannot afford private-sector services. There is a brilliant opportunity for government to innovate and meet the needs of everyone better. Longtime friend of Code for America and the civic tech community at large, Jake Brewer, unexpectedly passed away days before the Summit. On his desk, his family found a post-it that read “Cultivate the Karass.” In the opening remarks of the Summit, CfA’s Director of Community Organizing, Catherine Bracy, explained that the Karass, from Kurt Vonnegut’s Cat’s Cradle, is “a group of people who, unknown to themselves, are affiliated or linked in this powerful network greater than the sum of its parts.” This idea encapsulates so much of what Civic technology is about: People from far and wide committed to an ideal and, often, thankless work that may feel like a amalgamation of tiny steps but collectively transform people’s — the people’s — lives. This almost anthemic phrase serves as inspiration and, even, reminder that the work of civic technologists is often being one small part of something large, long-term, and, most of all, important. As a first-time attendee to the Code for America Summit, I was inspired by the sheer quantity and diversity of civic innovation projects happening around the world. The Summit wasn’t just compelling talks from director-level government officials on a shiny big stage; it was the opportunity to engage face-to-face with hundreds of technologists (loosely defined!) who have committed themselves as civil servants or volunteer brigade members. They’re building platforms for everything from open-source justice system database management to voicemail-based community polling, tackling massive problems like universal healthcare and over-reliance on incarceration.